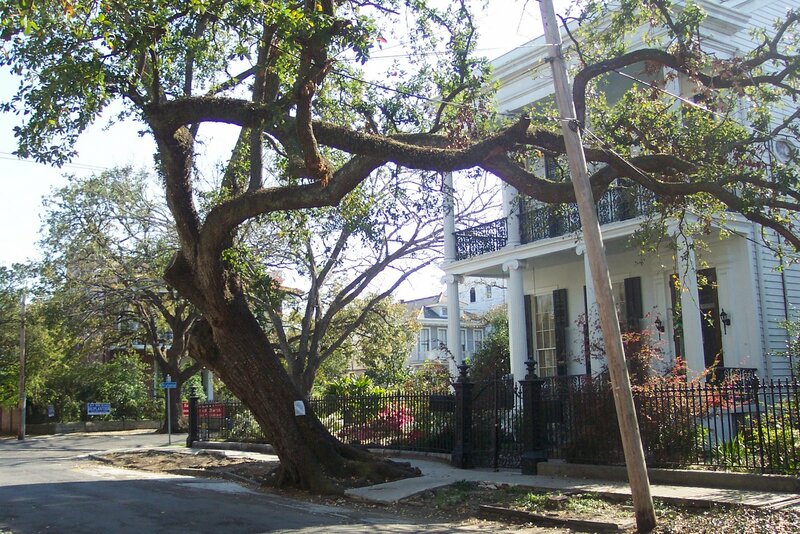 I think I could have a whole blog called “New Orleans Live Oaks”, and have a paragraph to write about each one. This tree is in the Garden District, at 7th and Prytania. I took this photo in March of ’06, when Katrina / Rita cleanup was being executed with reckless fervor and wild abandon. DO NOT REMOVE THIS TREE. THIS TREE HAS BEEN LEANING IN THIS MANNER FOR OVER 50 YEARS AND DID NOT MOVE OR TAKE ON ITS CURRENT POSITION AS A CONSEQUENCE OF WINDS SUSTAINED BY HURRICANES KATRINA AND RITA. 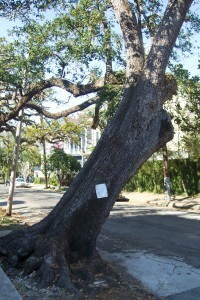 FURTHER IN LATE OCTOBER 2005, THIS TREE WAS INSPECTED BY A LICENSED ARBORIST EMPLOYED WITH BAYOU TREE SERVICE, INC. WHO DETERMINED THAT THE TREE WAS HEALTHY AND POSED NO THREAT OF FALLING OVER. SHOULD YOU HAVE ANY QUESTIONS, PLEASE CONTACT THE OWNER OF 1506 SEVENTH ST. AT 585-XXXX OR 451-XXXX. Just as some businesses survived all of the weather disasters of 2005, yet still had to close because the customer base moved away, imagine the panic these people felt to have this amazing tree that survived not only the 4 major hurricanes of the past century, but untold numbers of storms in the century or centuries before that, at risk of being brought to the ground by some mouth-breathing government worker with a chainsaw. I suspect that if ‘druthers were had, the author would quit his or her job and stand sentry on that upper gallery with a shotgun. I would. At the time, it wouldn’t be out-of-place to add, “We Will Shoot!” to that note. There are thousands of these trees in New Orleans and the city and private citizens pay lots and lots and lots of money to keep them healthy, mostly to Bayou Tree Service, Inc. I see their trucks everywhere, always.